You and Your Money: What's On Your Bucket List? 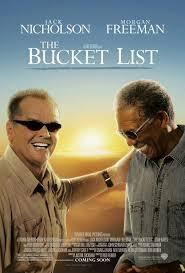 The movie, “The Bucket List” is a great movie starring Jack Nicholson and Morgan Freeman. 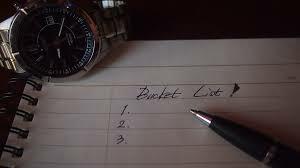 It is about two terminally ill men who have a list of things they want to do before they “kick the bucket.” I think everybody needs a bucket list. When is a good time to create your bucket list? Now! Especially if you are approaching retirement. Sit down and brainstorm ideas, no matter how silly they are. Skydiving? Drive a race car? Take grandkids to Disneyland? There are no right or wrong answers. Sometimes a bucket list can lead to a big change in life. My wife is the queen of bucket lists. On her list was completing a marathon. This started something in her life and now she’s an Ironman triathlete. Recently, she climbed Mt. Kilimanjaro, something that definitely was NOT on my bucket list. Once you have your bucket list, create a timeline that describes when you want to accomplish items on your list. Put your longer trips and more difficult adventures earlier. Your shorter, less taxing things should go later. For example, skydiving might be easier in your 60s than your 80s. Fourteen-hour plane flights are easier to do when younger. This list can help you create a budget. These are the fun things you want to do and some may cost more than others. For example, my wife’s Mt. Kilimanjaro trek was much more expensive than doing a marathon. Marathons aren’t very expensive, so she can do several a year. A trip like hiking in Africa is much more expensive. It may take several years to save up for this trip. Having your bucket list and timeline can help ensure that you complete what is important to you. It also helps you budget for your lifestyle in retirement. When will you write down your bucket list? Start now! Don’t worry if it changes over time, that can be a good thing. Just ask my wife, the Ironman.